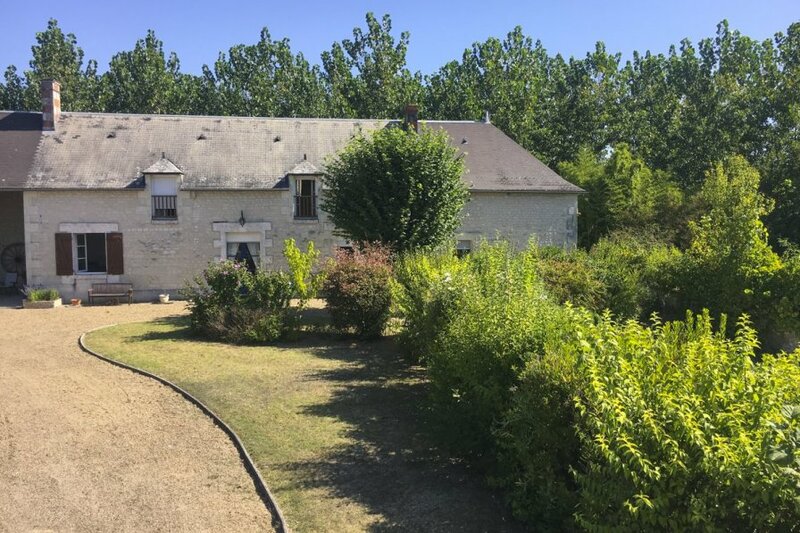 Create cherished family memories in this charming home near the 17th-Century town of Richelieu in the southern part of the beautiful Loire Valley. The lovely owners of this old stone farmhouse have created a warm and welcoming place ideal for relaxing holidays with family and friends. With six sweet bedrooms, including a spacious family bedroom, two new bathrooms and a comfortable living room with an open-fireplace, this has been their much-loved holiday escape for many years. Step outside to find a hidden corner in the pretty gardens, dine with family and friends al-fresco in the shade of the covered terrace or relax by the heated swimming pool. Just by the pool is also an old barn which has been brilliantly converted to a games room where you will find children's toys and games, table-tennis, table-football and badminton. That said, you may prefer a leisurely game of French boules in the courtyard before retiring to a secluded spot for a glass of local wine. Surrounded by sunflower fields and farmland, the home also backs on to woodland filled with beautiful butterflies and birds. You can stroll down the road to the village bakery to bring back your morning croissants before exploring for the day. There are some lovely bike routes and walks nearby; you can cycle about 10 km to Richelieu for nice restaurants, shops and a stunning historical park as well as the French weekly market. Further afield explore the fairy-tale castle, sample wines in caves or canoe along the Vienne River in historic Chinon, spend the day by the Loire River in stunning Saumur or head towards Tours or Blois, together with a visit to one of the spectacular chateaux that the Loire valley is so famous for. With the brilliant Futuroscope Park within half an hour, tree-top adventures and horse-riding nearby plus La Brenne Nature Reserve a little further, this is a fantastic location with activities for young and old across the wonderful Loire Valley. Les Papillons is located in the Loire Valley in the southern part of the Indre-Loire department, near the border of Vienne. On the edge of a village, you are surrounded by countryside and farmland with sunflowers in the summer months. Spot butterflies and rare birds in the woodland that backs on to the house. This area is especially great for walking and cycling along the surrounding roads straight from the house. There are also fishing opportunities nearby. You can stroll into the small village where you will find a bakery for your morning bread and pastries and there are two local restaurants within a 2-3km drive, with more a little further. You can cycle or drive to nearby Richelieu (10km) quite easily where you will find a greater variety of restaurants, supermarkets and shops as well as a wonderful French weekly market. Here you will also find tennis courts and a historic park with a mini-zoo and children's playground. Across the summer there are some great events taking place. Just further north, resting on the banks of the Vienne River, is the medieval town of Chinon (32km). Follow the winding streets full of little shops and restaurants up to the castle and appreciate the history all around you. It's also a wine producing town so be sure to stop off in one of the town's caves where you can sample some local produce! Hire canoes for a leisurely afternoon by the river. There are some fantastic activities around the region from golf within an hour near Saumur or Fontevraud, horse-riding in the local countryside and both hiking and cycling routes nearby. Keen cyclists can head up to the Loire River and follow parts of the long Loire a Velo trail along the riverside. The Saint Benoit Aventure (42km) tree-top climbing centre is a must for those seeking adventurous activities such as zip-lines, monkey bars and swings. The fantastic Futuroscope park (43km) is just half an hour away; a great day out for all the family with various amazing attractions and theatre shows. For a quieter time La Brenne nature reserve (97km) is worthy of a visit to the south-west with over 1000 ponds/lakes and an impressive amount of flora, fauna and wildlife, especially birds and butterflies. Bird lovers may also enjoy the spectacular shows in Chauvigny (50km) with birds from all over the world flying around the ruins of the castle. Tours (65km) is a wonderful place to visit not only for its fascinating history but also high-end gastronomy with some amazing markets across the city. Combine with a visit to one of the archetypal castles in this part of the valley including Chateau de Villandry (55km), Chateau Royal d'Amboise (85km) and Chateau de Chenonceau (78km). A little further but worth the drive is Chateau de Chambord (138km) which should be combined with a visit to the utterly beautiful town of Blois (127km) on the Loire river. For further exploring, head north-west to Saumur (67km), also resting on the Loire River, it has a reputation for its excellent restaurants, its famous equestrian school Cadre Noir and the delicious sparkling white wine which you can sample in the area. Visit the fairy-tale chateau, take a boat up the Loire river or hire canoes. Combine with a visit to the Fontevraud Abbey (53km) or the fascinating Troglodyte caves in Rochemenier (79km).